Supersize subculture has taken a toll, spreading beyond the American appetites and into Asian affinities. 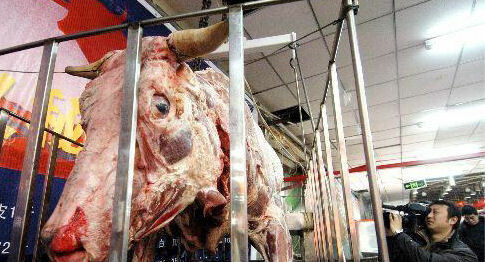 Weird Asia News points to one such instance where a Chinese company boiled a 1500 pound cow whole. Putting men to shame, the thick meat took 10 hours to cook and more mouths to eat than could be competed with. While the money raised from selling the meat went to charity, PETA most likely doesn't condone whoring meat out for Billy's education. They certainly have a strange way of cooking their cows. I am currently in North China and I still can't get over the fact you can buy dogs heads, dog paws and dog tails at the local supermarket! If I wasn't vegetarian already then I certainly would've been converted. And did I mention their love of chicken feet!